Contact MOCAP Sales or Customer Service for a no-cost, no-obligation quote. When your application requires something more than a standard part, MOCAP offers several secondary operations to convert, enhance or improve your product. We can create custom sleeves, rings, slots, covers, masks, and punch outs at the most economical prices. 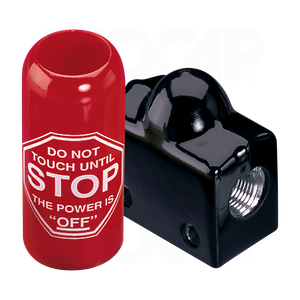 Printing can add your logo or other valuable information to most dip molded vinyl plastic caps, plugs and grips. Multi-color and consecutive number printing are also available. Slicing to remove a portion of the part creating a custom fit or specialized function.